National Geographic calls Dublin ‘Europe’s largest village’. It says Ireland’s ‘intimate’ capital exudes a friendly vibe, and invites people to stroll around to discover historic Georgian squares and cosy pubs. It also mentions other attractions like the revamped National Gallery of Ireland, and the new Irish Emigration Museum. It’s a reminder that Dublin is still a good weekend break if you’re from ‘down the country’ yourself! This popular route in the Middle East comes in at number nine in the top ten places to visit in 2018. The hiking path links ancient trade routes. Forests, canyons, and desert all feature, as well as a stroll along the shore of the Red Sea. It’s believed that Jesus, Moses, and Mohammed all walked these routes. National Geographic puts forward Sweden’s third largest city as a gastronomic delight. They say that foodies flock to Malmö to sample a global smorgasbord offering everything from cutting-edge Nordic cuisine to the number one street food, falafel. A little further away! It’s a surfer’s paradise, while agri-tourism experiences also feature large in the area. Hawaii’s capital, Honolulu, is just a short distance away. 2018 will be a big year in Vienna for art lovers. It will mark the centenary of the death of three leading members of the city’s Secession art movement: Gustav Klimt, Koloman Moser, and Otter Wagner. Special exhibitions will be held all year long. Again, a little more exotic and far-flung! Oaxaca was hit by earthquakes in September, but is already recovering well. Visitors can see ancient ruins and shop for the area’s famous wool rugs and other textiles. The colours come from dyes made from fruit…and insects! Sydney is always a great city to visit, and the iconic Sydney Opera House will be better than ever in 2018. A two-year $273 million upgrade has just been completed there. Improvements include better acoustics, a hangout-friendly foyer, and the return of the Australian Ballet. And that’s just one of the many attractions Sydney has to offer. This beautiful city is one of the highlights of the Baltics. There are Persian, Arab, Byzantine, Ottoman, Russian and Soviet influences to the colourful architecture of this eclectic place. It’s also known for 24-hour sulphur baths, and the legendary hospitality of the locals. A real wilderness experience comes in at number two in the list of top ten places to visit in 2018. Jujuy is home to a World Heritage site. The narrow valley is cloaked in colorful rock bands crafted over millennia. It’s located in the northwest of Argentina – not easy to get to, but highly memorable if you do. 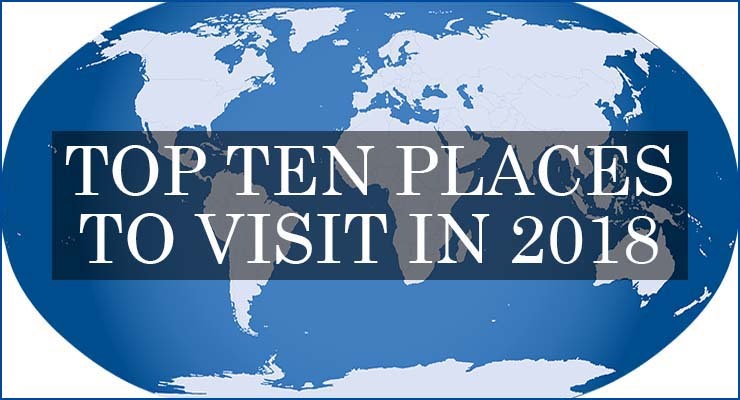 And finally…number one in the top ten places to visit in 2018 is somewhat off the beaten track. National Geographic acknowledges that tourists rarely travel to this city in Eastern Ethiopia – but says they are missing a treat. They label Harar as an ‘enchantingly contradictory’ city. They say attractions include 82 mosques, Ethiopia’s best beer, its strongest khat (an ubiquitous narcotic plant), and highest quality coffee. And watch out for hyenas roaming the streets at night! Wherever you may decide to travel in 2018, make sure that you and your travelling companion(s) are carrying comprehensive travel insurance for the trip. A policy with Insure My Holiday will entitle you to some of the best levels of cover at some of the best rates around. This is whether you choose single trip travel insurance for your holiday, or annual multi-trip travel insurance, if you’re likely to do more travelling in the coming year too.